Oh Biscuit - we have a love/hate relationship, don't we? I was mesmerized by Laura Hillenbrand's second book, Unbroken. Upon recommendation from my dad, I decided to read her first novel too. 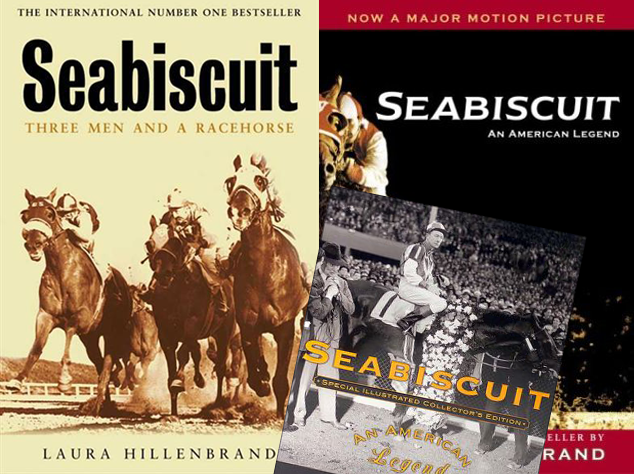 I had high expectations going into Seabiscuit, having just loved Hillenbrand's other book. I'm sad to say, the Biscuit did not live up to my high hopes. The novel chronicles the successful career of Seabiscuit, a racing horse in the 1930's. We get a glimpse into the lives of his trainer, owner and jockey as well. I think where the book falters, is that the reader does not get a larger view into the lives of the actual people caring for, and working with, Seabiscuit. Much of the book chronicles Seabiscuit's career in minute detail. I found this to be both monotonous and boring. I would have liked to learn more about the people and less about the races. Needless to say, I now know more about race horsing than I ever wanted to know. It seems obvious that a book about a racehorse would chronicle race horsing but I didn't know it would be so detailed! I'm going to go out on a whim here and say, skip this one for the next book on your reading list. If you're interested in reading a Laura Hillenbrand book, I strongly recommend her other novel, Unbroken, instead.